Mayawati wants UP divided into 4 parts! She has been doing Bull $#!T for years, she wants to just keep on doing it forever-and-ever? What about Telangana then? Isn't it an issue of 'Popular Demand' too?? Till when are politicians going to work on 'Divide and Rule' policy. 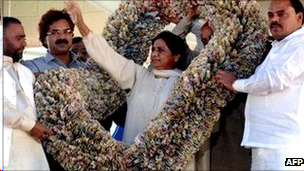 a Note to Mayawati: Don't Bull$#!T around no more! If it's time for you to go, leave amicably. Dr. B. R. Ambedkar's been dead for long, and I am sure his ideology has been around since longer than he has been dead, why did you just want to go for division?